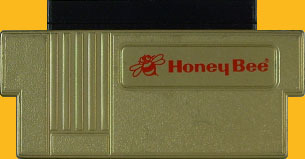 This gold HoneyBee is 60 to 72 pins, meaning you can play your Famicom games on your NES. For someone unsure of whether or not they want to begin collecting Famicom games, a converter like this for your NES is a great place to start. With a 60 to 72 pin converter, you can test the water without diving in. HoneyBee converters are considered to the best quality of all the converters available. That’s not always true. It depends on how much the HoneyBee — or any converter, for that matter — has been used. The more use a converter goes through, the more “gapped,” if you will, the cartridge pin connectors will become — much like the receiving pins in the Famicom itself. So, the newer the converter, the better it likely is. Though some generic brand converters are nothing but junk. A gold HoneyBee once sold on eBay for over $50. Though the HoneyBees can fluctuate in sale price, $50 for a converter is an outrageous price to pay. If you’re patient, you can get one for less than $20. But the HoneyBees are highly sought after, so a lot of patience might be required. Much fatter than the 72-to-60 pin HoneyBee.